The mission of the Department of Weights and Measures is to protect consumers and businesses alike in all commercial transactions based on weight or measure. Enforce the provisions of the Agriculture and Markets Law, Rules and Regulations as they relate to weights and measures. Aid consumers and businesses alike to provide an equitable transaction based on weights and measures. Inspection and testing of commercial weighing and measuring devices in stores, markets, warehouses, gas stations and other establishments. Devices found to comply with NYS laws and regulations and NIST specifications and tolerances. A nominal fee is charged for inspections of devices. Weigh, measure and inspect packaged commodities to determine the accuracy of labeling practices. Respond to consumer complaints by investigating or testing as the occasion demands. Operates a Petroleum Quality Program that sample gasoline and diesel fuels and enforces labeling, octane, and quality requirements of petroleum products used by motor vehicles. Inspection and testing of non-commercial devices as per request. A nominal fee is charged for inspections of devices. Consumer education is provided in the form of lectures and literature. Contact the director to arrange speaking engagements or to receive literature. 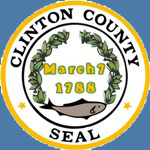 The Clinton County Department of Weights and Measures operates under the authority of the Commissioner of Agriculture and Markets in the enforcement of the provisions of Article 16 of the New York State Agriculture and Markets Law and Chapter V of the Rules and Regulations pursuant to Article 16. All standards used by the department are certified by the NYS Bureau of Weights and Measures according to NIST standards. Technical questions and copies of laws, rules and regulations, and standards certifications can be obtained from the NYS Bureau of Weights and Measures, 10B Airline Dr., Albany, NY 12235, (518) 457-3146. 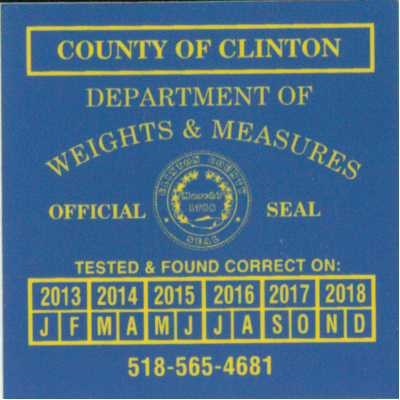 All specification, tolerances and requirements for the design and testing of commercial weighing and measuring devices as published in Handbook 44 are used by the Clinton County Department of Weights and Measures. Procedures used for weighing, measuring and inspecting packaged commodities to determine the accuracy of labeling practices are according to Handbook 133. Copies and questions should be directed to NIST.